a range of issues affecting productivity and quality of life in Canadian cities and communities (e.g., traffic congestion and community infrastructure). While many aspects of transportation, infrastructure and communities are exclusively the responsibility of the provinces, such as highways, public transit and municipal infrastructure, the federal government may have a role where it is perceived that the national interest is at stake. Given Canada’s vast geography, sparse population and dependence on external trade – arguably as much a reality today as it was at the time of Confederation – having an efficient transportation system has always been of paramount importance. For this reason, there has been a parliamentary committee to examine transportation legislation, policy and related issues in Canada since Confederation in 1867. The committee has had various names since 1867 and has been known as the Standing Committee on Transport, Infrastructure and Communities since 2006. Under various names, the committee has studied and made recommendations concerning pivotal events in Canada’s transportation history, such as the creation of the Canadian National Railway as a Crown corporation in 1919 and its eventual privatization in 1995, and economic deregulation in the airline industry in 1987. The committee was instrumental in developing the Canada Transportation Act (1996) and more recently considered and reported on other issues of national importance such as the merger of Air Canada and Canadian Airlines International Ltd. (1999), competition in the airline industry and the airports system (2005) and changes to the Navigable Waters Protection Act (2008). In the execution of its functions, each committee is normally assisted by a committee clerk, an analyst and a committee assistant. Occasional assistance is also provided by legislative clerks and lawyers from the Office of the Law Clerk and Parliamentary Counsel. All of these individuals are non-partisan and serve all members of the committee and representatives of all parties equally. The clerk performs his or her duties and responsibilities under the direction of the committee and its Chair. As an expert in the rules of the House of Commons, the clerk may be requested to give advice to the Chair and members of the committee should a question of procedure arise. The clerk is the coordinator, organizer and liaison officer for the committee and as such will be in frequent contact with members’ staff. He or she is also responsible to invite witnesses and to deal with all the details regarding their appearance before the committee. The committee assistant provides a wide range of specialized administrative services for, in particular, the organization of committee meetings and the publishing of documents on the committees’ website. The committee assistant works with the clerk to meet the needs of committees. 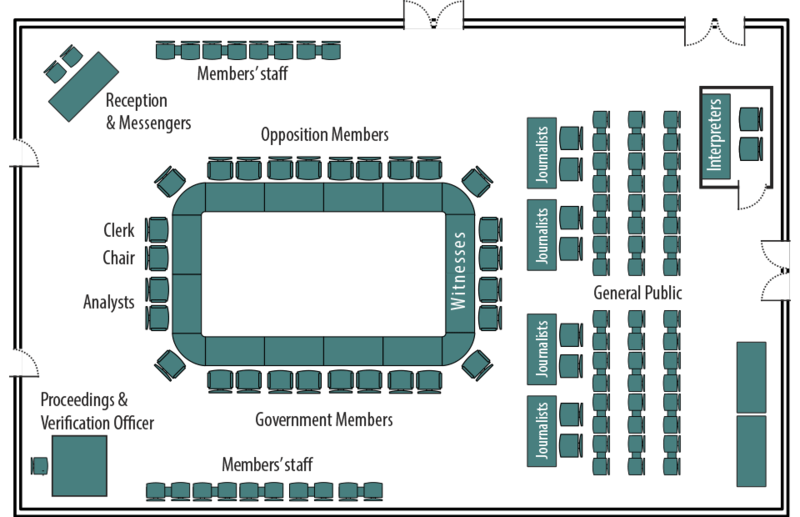 The Library of Parliament’s analysts provide authoritative, substantive, and timely research, analysis and information to all members of the Committee. They are part of the Committee’s institutional memory and are a unique resource for parliamentarians. Supported by research librarians, the analyst works individually or in multidisciplinary teams. Analysts can prepare: briefing notes on the subjects being examined; detailed study plans; lists of proposed witnesses; analyses of an issue with a list of suggested questions; background papers; draft reports; news releases; and/or formal correspondence. Analysts with legal training can assist the Committee regarding any substantive issues that may arise during the consideration of bills. Within the Office of the Law Clerk and Parliamentary Counsel, Parliamentary Counsel (Legislation) are available to assist Members who are not in Cabinet in the preparation of private Members’ bills or of amendments to Government bills or others. At various stages of the legislative process, Members may propose amendments to bills. Amendments may first be proposed at the Committee Stage, during a committee’s clause-by-clause review of a bill. Amendments may also be proposed at the Report Stage, once a bill returns to the House. Once bill is sent to Committee, the clerk of the Committee provides the name of the Parliamentary Counsel (Legislation) responsible for the drafting of the amendments for a particular bill to the Members. The legislative clerk serves all members of the Committee as a specialist of the process by which a bill becomes law. They are available to give, upon request from Members and their staff, advice on the admissibility of amendments when bills are referred to Committee. The legislative clerk organizes the amendments into packages for committee stage, reviews all the committee amendments for procedural admissibility and prepares draft rulings for the Chair. During clause-by-clause consideration of bills in committee, a legislative clerk is in attendance to assist the committee concerning any procedural issues that may arise. The legislative clerk can also provide Members with advice regarding the procedural admissibility of Report Stage amendments. When a bill is sent to committee, the clerk of the committee provides to the Members the name of the legislative clerk assigned to the bill. The Parliamentary Budget Officer (PBO) has a mandate to support Parliament and parliamentarians in holding the government to account for the good stewardship of public resources. The Federal Accountability Act of 2006 mandates the PBO to provide independent analysis to the Senate and to the House of Commons regarding the state of the nation’s finances, the government estimates and trends in the national economy. The enabling legislation also provides the PBO with a mandate to provide analytical support to any committee during its consideration of the estimates, as well as provide advice to any Member of Parliament regarding the financial cost of proposals. Since 2010, the committee has studied legislation, spending proposed by the government and emerging issues within its mandate, either on its own initiative or at the request of a Minister. The committee considered and reported on numerous government and private members’ bills proposing to amend the Canada Transportation Act, the Railway Safety Act, the Aeronautics Act, the Aviation Industry Indemnity Act, the Air Canada Public Participation Act, the Canada Marine Act, the Canada Shipping Act, 2001, the Marine Liability Act, the Motor Vehicle Safety Act, the Canada Post Corporation Act and the National Capital Act. The Treasury Board of Canada Secretariat releases estimates publications throughout the fiscal year to support appropriation acts, which provide authority for government spending. Each fiscal year, the committee has invited the ministers and their officials to meet and answer questions about planned departmental expenditures contained in the main estimates and/or the supplementary estimates. the management and operation of Canada Post Corporation (2010). Updating Infrastructure in Canada: An examination of needs and investments (report tabled June 2015). The committee examined the magnitude and impacts of federal government investments in public infrastructure in Canada as well as the preliminary progress of the New Building Canada Plan. The committee made recommendations concerning the New Building Canada Plan, the Gas Tax Fund, capacity building in asset management for municipalities and public-private partnerships. Review of the Canadian Transportation Safety Regime: Transportation of Dangerous Goods and Safety Management Systems (report tabled March 2015). At the request of the Minister of Transport and in response to the 2013 rail accident and explosion in Lac-Mégantic, Quebec, the committee reviewed the legislative framework for safety in the federal transportation system. The committee made recommendations respecting, among other things, the standards for rail tank cars, the liability and compensation regime for rail and marine accidents, and the use of on-board voice and video recordings by railways. Transit in Canada (report tabled February 2012). The committee reviewed communities’ needs for and benefits from transit, how transit is funded in Canada and the potential for a National Transit Strategy for Canada. The committee made recommendations concerning future federal and private sector transit funding. Innovative Transportation Technologies (report tabled February 2013. The committee surveyed new technologies that could reduce the environmental impacts and increase efficiency and safety in the Canadian transportation system. The committee made recommendations on various subjects including research and development funding and alternative fuel vehicles.